Life Cycle Analysis is an important environmental management tool to gauge the impact of a product on the environment from its manufacturing stage to its final disposal / disintegration. Packaging is both a symbol of society's consumption habits and reflection of its progress. The user expects it to have better strength, easier handling, to be lighter, more aesthetic, safer from a hygiene point of view, etc. The manufacturer undertakes research and development to meet these demands and to offer a high quality product. In addition to its standard attributes, today's packaging just also contribute to protecting the environment, and certainly must not damage it besides being friendly to human health. The packaging referred to in this document is used to pack and distribute bulk products, like cement, fertilizers, sugar, food grains, salt, chemicals, oilseeds etc. as opposed to the carry bags that vendors offer their customers for carrying various edible/non-edible items purchased in retail. Today where there is a lot of controversy about different packaging materials and their environmental credentials, an ecological assessment as well as study of effects on human health is necessary. In view of this ICPE (Indian Centre for Plastic in the Environment, New Delhi) decided to carry out a Life Cycle Analysis (LCA) of bulk packaging materials (Jute Sacks, PP-HDPE woven Sacks and Paper Sacks) with a capacity of 50 kg or below. 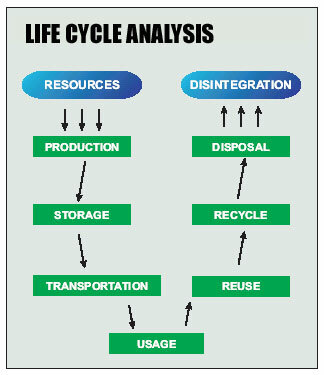 Life cycle analysis is an effective tool to measure the impact of a product or process on the environment. In this study, it covers the environmental and resource impact of PP-HDPE woven sacks in particular vis-à-vis Jute/Paper from the stage of raw material extraction, production, use and disposal, taking into account all the inputs such as materials, energy, capital equipment, man-hours, etc.) 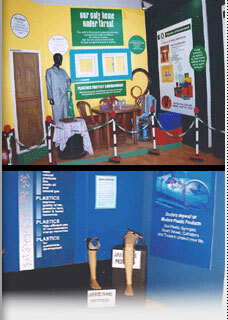 and the outputs like products, by-products, waste materials, emissions at every stage using cradle to grave approach. 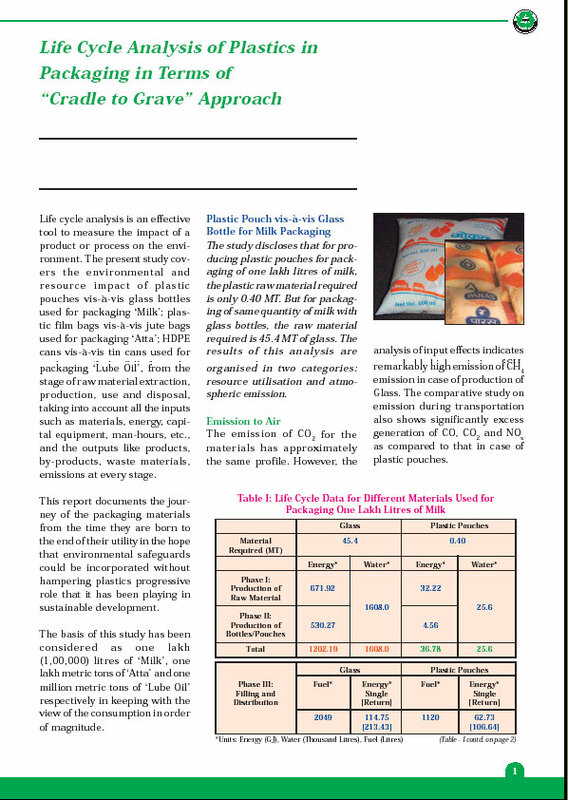 The analysis by steps identifies the production of jute and paper and subsequently manufacture of sacks as being responsible for the greatest consumption of energy (~ 669.6 Thousand GJ/MMT of packed product) in case of paper bag and 333 Thousand GJ/MMT of packed product in case of jute sacks as compared to PP-HDPE woven sacks (~ 226.8 Thousand GJ/MMT of packed product). Energy consumption related to transportation of bulk goods shows that transportation in jute sacks requires significantly excess amount of energy, being about 2036 GJ/MMT of packed product in case of jute sacks, and 928 GJ/MMT of packed product where paper is being used as packaging material (compared to transportation in PP-HDPE woven sacks). Another major resource utilization is being demonstrated in terms of consumption of water. The manufacture of jute and paper sacks is found to be responsible for the overall greatest consumption of water; ~ 22 Thousand lakh litre/ (MMT of packed product) in case of jute bag production and ~ 18 Thousand lakhlitre/ (MMT of packed product) in case of paper bag production. This is about 10 (jute) and 7 (paper) times higher than that for PP-HDPE woven sack for one MMT of packed product. Furthermore, both the production of jute and paper sacks requires utilization of chemicals in the tune of 258 ton/MMT of packed product (for jute) and 4647 ton/MMT of packed product (for paper) whereas almost negligible amount of chemicals of this nature are required at all for production of PP-HDPE woven sacks (0.014 ton/ MMT of packed product). 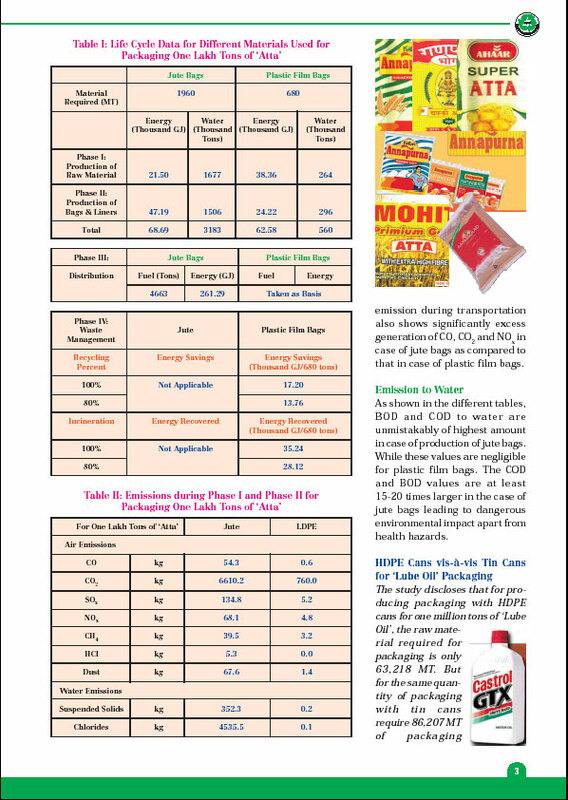 The energy requirement and more particularly health hazards connected to these should be taken into consideration for comparison of the three materials for bulk packaging purposes. More importantly attention is also given to two end-of-life cases i.e.,100% incineration (waste to energy) and/or 100% recycling with energy recovery/saving. 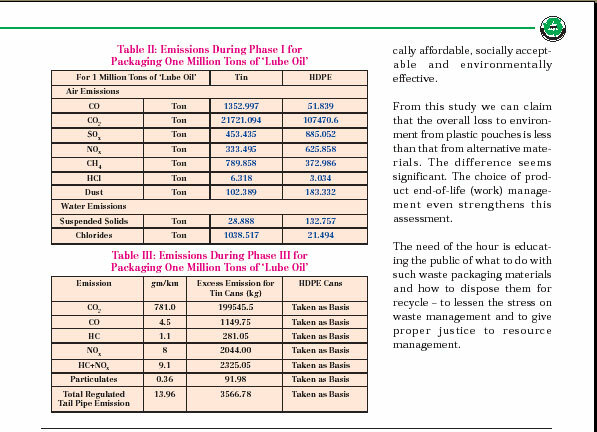 According to this phase energy recovery due to incineration is about 95 Thousand GJ for PP-HDPE woven sacks used for packaging one MMT of bulk commodities as compared to ~170 Thousand GJ in case of paper sacks used for packaging one MMT of bulk commodities. Similarly energy savings due to recycling is found to be 47 GJ for PP-HDPE woven sacks used for packaging one MMT of bulk commodities while it is only 32 Thousand GJ for paper sacks used for packaging one MMT of bulk commodities. It should also be noted that in case of recycling of plastics the waste enters into a new life and if the waste management technique is taken into consideration the life cycle analysis of plastics can be termed as "Cradle to Cradle" approach instead of "Cradle to Grave". In this phase minimum or almost no recovery of energy is at all in practice for waste jute sacks. 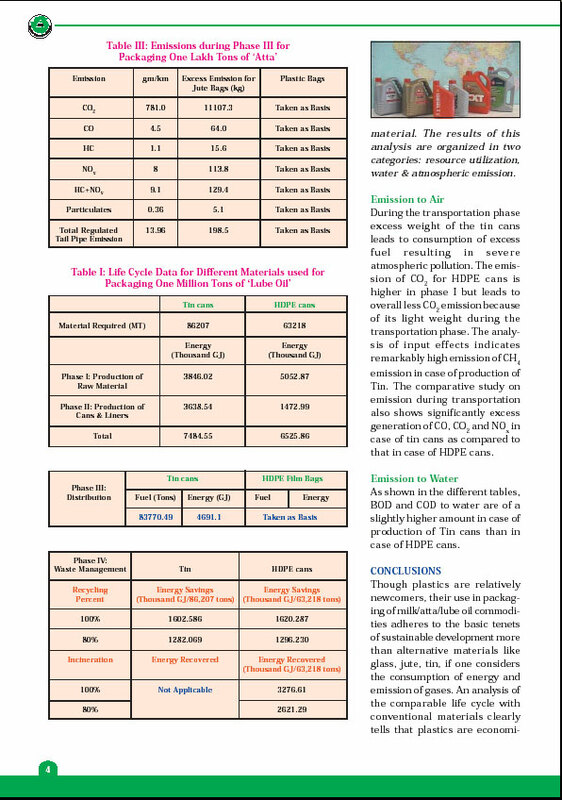 The emission of CO2 for the materials has approximately the same profile. However, the analysis of input effects indicates remarkably high emission of CH4 emission in case of production of jute bag. The comparative study on emission during transportation also shows significantly excess generation of CO, CO2 and NOx as compared to that in case of PP-HDPE woven sacks. The standard of living of PP-HDPE workers is much better, compared to those toiling in Jute and Paper in conditions far from congenial to human health. Jute farmers suffer from respiratory diseases, skin disorders, and certain cancers-- arising from nitrogen dioxide, hydrogen sulfide, ammonia, carbon dioxide and methane produced during its cultivation. Besides, the workers are required to remain for 6 to 10 hours in waist-deep water during retting of Jute. In addition, the Jute Batching Oil used during softening process of Jute remains in the final Jute sacks. Food substances packed in Jute sacks have the potential to jeopardize human health by causing several illnesses such as dizziness, headache, nausea and vomiting, etc. The toxic chemicals released by Paper industry have enough potential to harm earth's life forms. In forests, where pulp mills sludge has been disposed, dioxins have accumulated in the tissues of field animals and have caused bio-chemical effects on birds. As dioxin resist natural breakdown processes, they build up over time in the environment and can undergo continual recycling through out the environment. 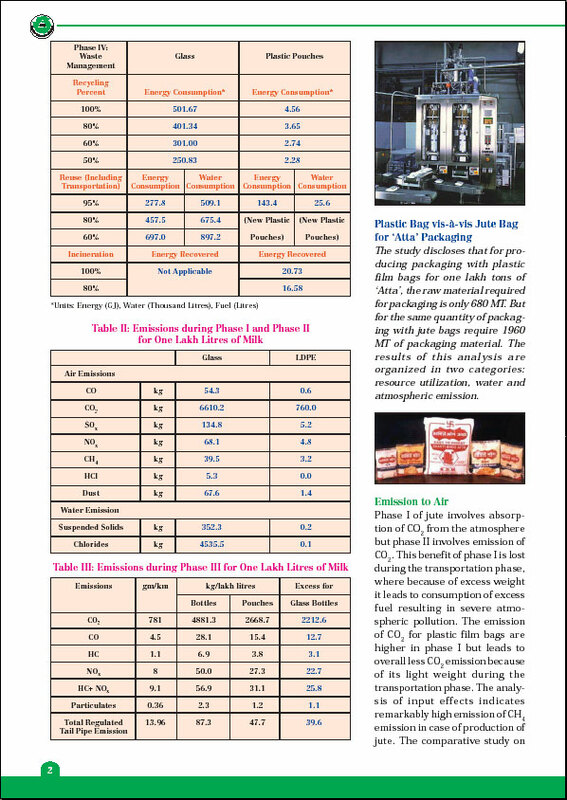 Thus, even if production of dioxin ceases, levels already present in the environment will take long time to decrease. Finally, organo-chlorines are found in the paper products themselves. The study of mortality rate of these workers is absolutely necessary to study and direct weightage to be given while considering the total impact assessment. Needless to mention such health hazards are non-existent for PP-HDPE woven sacks, both at raw material stage as well as at sack manufacturing stage. Though plastics like PP-HDPE are relatively newcomers, the use of it in packaging of bulk commodities adhere the basic tenets of sustainable development more than materials like Jute and Paper, if one considers the consumption of energy, emission of gases and the use of chemicals. An analysis of the comparable life cycle with jute and paper clearly tells that plastics are economically affordable, socially acceptable and environmentally effective. Health hazards for workers in jute and paper are very high while those employed in plastics are almost free from such health hazards. While documenting the stages of procuring raw material for jute, PP-HDPE and paper, it highlights the facts that were hitherto kept under the wrap, such as the hazards on workers and environment caused by massive use of fertilizers, insecticides and chemicals in jute and paper. On the contrary, the use of PP-HDPE is not only safe, but as a whole actually saves more oil than needed for their manufacture. The recording of the stages of production of jute sacks, PP-HDPE woven sacks and paper sacks give a complete picture of the consumption of energy, water and gases in all the three materials and remove the prevailing notion that jute and paper are more environment- friendly than PP-HDPE. Another sensitivity in the study results in discovering the effects of the weight of the jute vis-à-vis PP-HDPE woven sacks on the overall loss to environment through transport of commodities. Managing waste help to produce more from fewer resources, while generating less pollution and waste. The measures to reduce the amount of solid waste produced, either as industrial, commercial or domestic waste, in essence are improvements in efficiency. Jute and paper as bulk packaging material cause more stress on waste management than PP-HDPE woven sacks. The residual plastics at less than 10 percent by weight of Municipal Solid Waste can provide 20 per cent of the fuel value for a local WTE plant. PP-HDPE-based bulk packaging is a vehicle for sustainable development, and is fully renewable and recyclable.